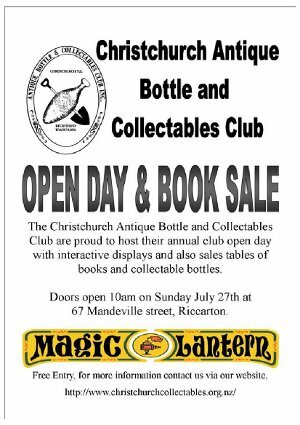 Please note that the christchurchcollectables.org.nz address is moving to christchurchcollectables.nz. In August 2015 the old address christchurchcollectables.org.nz will stop working. The new address is marginally shorter and hopefully easier to remember. The Baltic Sea island of Usedom is home to a museum for flat irons. It's run by a couple who have collected more than 3,000 of them on their travels. This year’s final Club meeting/barbecue will be at the Philatelic Centre, 67 Mandeville Street, this Sunday 30 November, commencing 6.00 p.m. There will be no themed Bottles or Collectables this month, but you are welcome to bring your New Finds. Door charge is $3 per person, and there will be a $1 raffle as usual. The next Club Meeting is at the Philatelic Centre, 67 Mandeville Street, this Sunday, 26 October, commencing 7.00 p.m. The Collectable theme this month is Gardenalia, and the Bottle theme is Poison bottles. There will also be New Finds as usual. Door charge is $3 per person. A Raffle will be available at $1 per ticket. Sales tables are now free, and there will be a separate table for individual items that members may wish to bring along to sell. The next Club Meeting is at the Philatelic Centre, 67 Mandeville Street, this Sunday, 28 September, commencing 7.00 p.m. The Collectable theme this month is Kitchenalia, and the Bottle theme is Kitchen bottles. There will also be New Finds as usual. Door charge is $3 per person. A Raffle will be available at $1 per ticket. Sales tables are now FREE, and there will be a special table for individual items that members may wish to bring along to sell. The next Club meeting is will be held on to be held this Sunday 31 August, commencing 7.00 p.m. Gary Moore and Lindsey Best will give an illustrated talk about their recent visit to Newcastle to attend the Australian Antique and Bottle Collectors’ Show. Members are asked if they could bring along an Australian Bottle or Collectable. Door charge is $3 per person. A Raffle will be available at $1 per ticket. Sales tables are available at a cost to sellers of $2. Visitors most welcome (and don't have to pay door charge!). Website moved to AWS hosting! Amazon Web Services (AWS) offer a basic free virtual hosting service. We've migrated the website to AWS as of today today. Amazon should offer an extremely reliable service, but it remains to be seen whether the website outgrows the limitations of the basic service. Read more about Website moved to AWS hosting! To be able to post to forums and to gain access to members areas of this website (club members have access to a "members only" area), you need to be a registered user. However, you must use the contact page to request an account. Unfortunately, we're getting too many fake accounts being created to be worth the effort of maintaining a registration page. You do not have to be a club member to request an account here, but if you are not a member, you can't access the members area. The next Club Meeting is this Sunday, 27 July, commencing 7.00 p.m., following our Open Day at the same venue. Collectable theme of the night is NZ Colonial, and the Bottle theme will be New Zealand bottles. There will also be New Finds as usual. Door charge is $3 per person. A Raffle will be available at $1 per ticket.Sales tables are available at a cost to sellers of $2. The next Club Meeting is this Sunday 30 June, commencing 7.00 p.m. Collectable theme of the night is Arts and Crafts Movement (1870-1910), and the Bottle theme will be coloured glass bottles. There will also be New Finds as usual. Door charge is $3 per person. A Raffle is available at $1 per ticket. Sales tables are available at a cost to sellers of $2. Bookings are still available for the Curragh Cottage supper on Tuesday 15 July. Cost is $10 per head with a film show to be screened for club members at the Ferrymead theatre for an additional $3.50 per head. The next Club meeting is also the Annual General Meeting, to be held this Sunday 25 May 2014, commencing 7.00 p.m. This will be followed by New Finds. Door charge is $3 per person. A Raffle will be available at $1 per ticket. Sales tables are available at a cost to sellers of $2. The next Club Meeting is this Sunday 27 April, commencing 7.00 p.m. Collectable theme of the night is ANZAC (note the 100 year commemoration this year), and the Bottle theme will be bottles 1910 - 1920. There will also be New Finds as usual. Articles for future Club magazines are welcome at any time. You can also place an advert in the magazine's Trading Post pages - this could be for items Wanted to Buy or To Sell. Contact Hugh. The next Club Meeting is this Sunday 30 March, commencing 7.00 p.m. Collectable theme of the night is Art Nouveau style, and the Bottle theme is Christchurch labeled. There will also be New Finds as usual. Door charge is $3 per person. A Raffle will be available at $1 per ticket. Sales tables are available at a cost to sellers of $2.